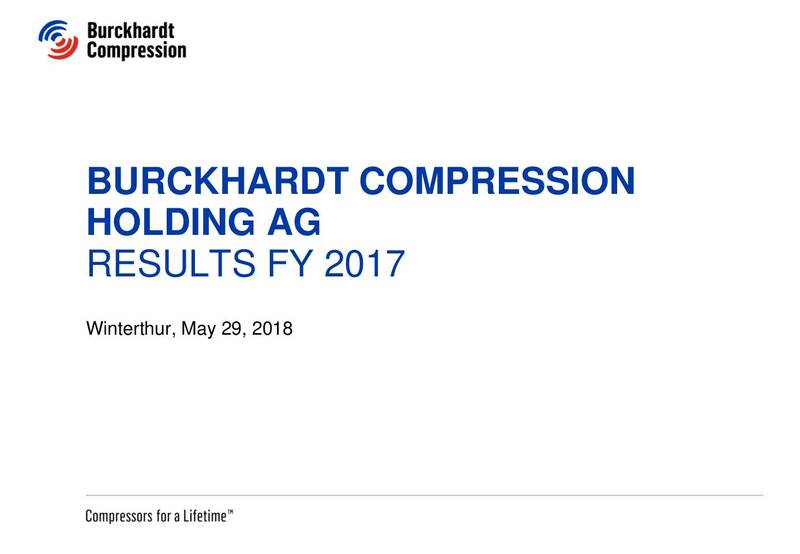 As expected, 2017 was a challenging year for Burckhardt Compression. Nevertheless, the company can report an increase in both order intake and sales. The margins met the expectations for the 2017 fiscal year, but are significantly lower than the targets for the coming years. Consolidated order intake amounted to CHF 525.2 mn, which is 10.6% higher than a year previ-ously. Excluding currency translation effects, there was a rise of 10.3%. The Systems Division accounted for CHF 319.8 mn of total order intake, or 14.0% more than in the previous year. This increase is explained primarily by the strong petrochemical and refinery business. Meanwhile, orders received in the Services Division rose by 5.7% to CHF 205.4 mn thanks mainly to good growth in the engineering business. 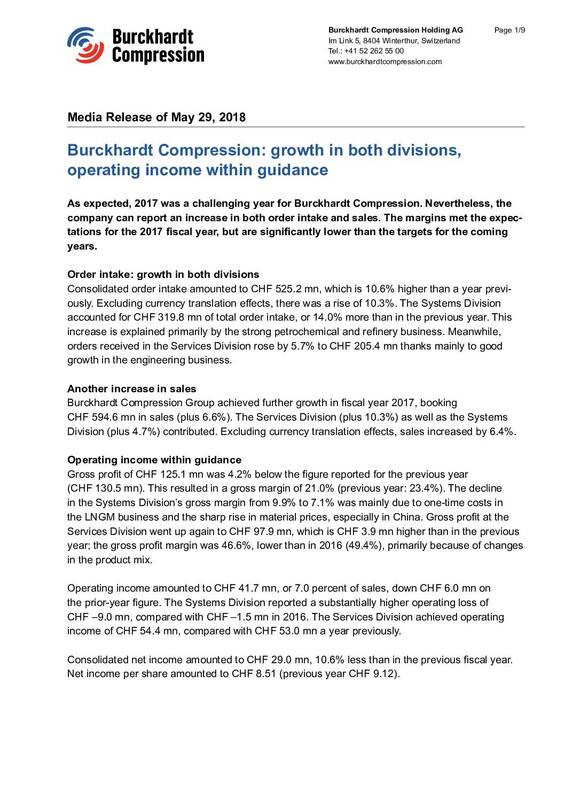 Burckhardt Compression Group achieved further growth in fiscal year 2017, booking CHF 594.6 mn in sales (plus 6.6%). The Services Division (plus 10.3%) as well as the Systems Division (plus 4.7%) contributed. Excluding currency translation effects, sales increased by 6.4%. Gross profit of CHF 125.1 mn was 4.2% below the figure reported for the previous year (CHF 130.5 mn). This resulted in a gross margin of 21.0% (previous year: 23.4%). The decline in the Systems Division’s gross margin from 9.9% to 7.1% was mainly due to one-time costs in the LNGM business and the sharp rise in material prices, especially in China. Gross profit at the Services Division went up again to CHF 97.9 mn, which is CHF 3.9 mn higher than in the previous year; the gross profit margin was 46.6%, lower than in 2016 (49.4%), primarily because of changes in the product mix. Operating income amounted to CHF 41.7 mn, or 7.0 percent of sales, down CHF 6.0 mn on the prior-year figure. The Systems Division reported a substantially higher operating loss of CHF –9.0 mn, compared with CHF –1.5 mn in 2016. The Services Division achieved operating income of CHF 54.4 mn, compared with CHF 53.0 mn a year previously. Consolidated net income amounted to CHF 29.0 mn, 10.6% less than in the previous fiscal year. Net income per share amounted to CHF 8.51 (previous year CHF 9.12). Total assets at the end of the reporting period amounted to CHF 797.6 mn, which represents a reduction of 1.7%, or CHF 13.4 mn, on the year-back figure. Current and non-current assets both decreased. The equity ratio increased from the previous year’s 39.1% to 42.0%. The net financial position at the end of the fiscal year came to CHF –62.1 mn, a slight improvement of CHF 5.2 mn compared to end-March 2017. Despite the very competitive environment, Burckhardt Compression successfully defended its market leadership position in the reciprocating compressor systems market. 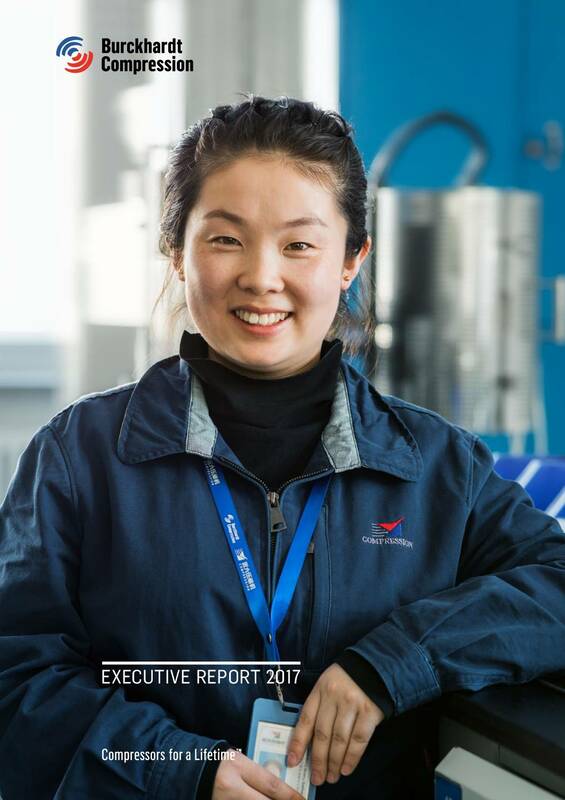 The Services Division continued to expand its market position and achieved largely organic sales growth of 10.3%. It also moved further into additional markets including Argentina and the Nordic countries. Further progress was made on the costsaving and optimization projects started some time ago, such as Value Engineering and Best-Cost Countries. Overall costs for compressors were reduced as a result. The Mid-Range Plan adopted in December 2017 sets different priorities for the two divisions for the next five fiscal years. The Systems Division is focusing mainly on improving profitability while maintaining global market leadership, whereas the Services Division is aiming for significant growth. The first priority for growth is service business involving compressors made by other manufacturers. This will be built up with the help of operational initiatives, including the implementation of a global ERP platform, the further expansion of the local and regional presence, and the expansion of service structures for the marine business. Ongoing digitalization will be used for new services and applications in both divisions. The Systems Division is aiming for sales of CHF 340 mn by 2022, with an EBIT margin of 0% to 5%, while the Services Division is targeting sales of CHF 360 mn and an EBIT margin of 20% to 25%. This strategy is based mainly on or-ganic growth, which includes the complete takeover of Shenyang Yuanda Compressor and Arkos Field Services. Burckhardt Compression believes that key sales markets will continue to recover in fiscal year 2018, making customers more willing to invest. With sales expected to match the 2017 level, the company expects a slight increase in operating income and net profit. The Board of Directors will propose a dividend of CHF 6.00 per share (CHF 7.00 in the previous year) at the annual general meeting. This corresponds to a payout ratio of 70.5% of net income (previous year according to Swiss GAAP FER 76.8%), which is at the upper end of the targeted range of 50% to 70%. The annual financial statements contained in this report are the first to be based on the Swiss GAAP FER accounting standard. Prior-year figures (fiscal year 2016) have been recalculated on the basis of this standard to provide proper comparability between this year and last.